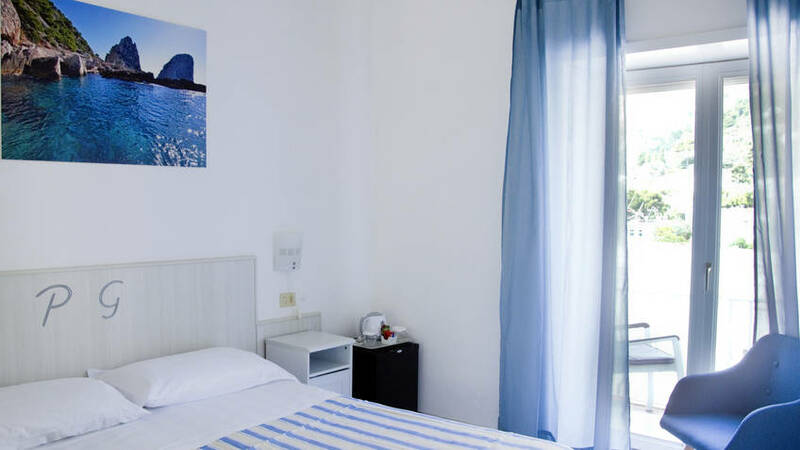 Hotel Guarracino is a traditional Capri residence, immersed in the lush greenery of the "Due Golfi" area, just 5 minutes from the center and 10 minutes from the marvellous beaches of Marina Piccola. The simply furnished rooms open out onto small flower-festooned terraces - the perfect place in which to soak up the island sun in blissful privacy. The Federico family offers guests a warm welcome, guaranteeing the sensation of a private home and the traditional, heart-felt hospitality for which the islanders of Capri are known and loved. All rooms have ensuite bathroom, heating, minibar, safety deposit box, air conditioning and satellite TV. Open all year. Hotel Guarracino is situated in the "Due Golfi" area of Capri, at the start of the pedestrian area which leads to Marina Piccola. Walk along Via Roma and in just five minutes you'll reach the 'Piazzetta, where the Funicular railway, bus, and taxi stations are located.